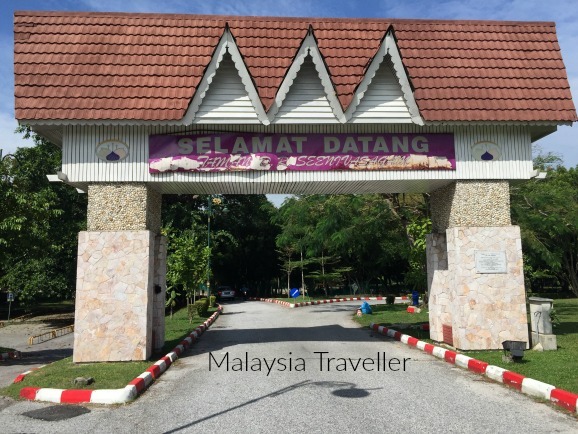 DR Seenivasagam Recreational Park (Taman D.R. 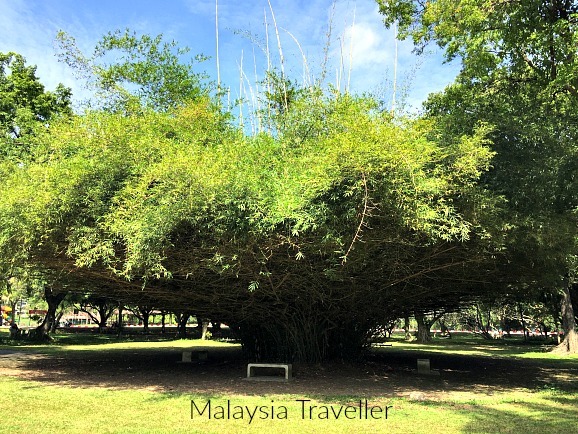 Seenivasagam) is a large urban park in the heart of Ipoh. It was opened in the early 1950s and originally named Coronation Park in commemoration of the Coronation of Queen Elizabeth II which took place in 1953. It was subsequently renamed D.R.Seenivasagam after a local prominent politician. The highlight of the park for me is the Japanese Garden which was officially opened in 1995 and designed with assistance from Fukuoka City Hall. Fukuoka was declared as Ipoh’s ‘sister city’ in 1989. At the time of my visit (August 2017) I had recently returned from a holiday in Fukuoka and I could recognise that the landscape gardeners had done their best to recreate the atmosphere of a Japanese garden. The garden is built around a lake with a small island reached by a Japanese-style red bridge. A pavilion is reminiscent of a Japanese tea house and a path surrounds the lake. A lotus pond adds to the ambience. 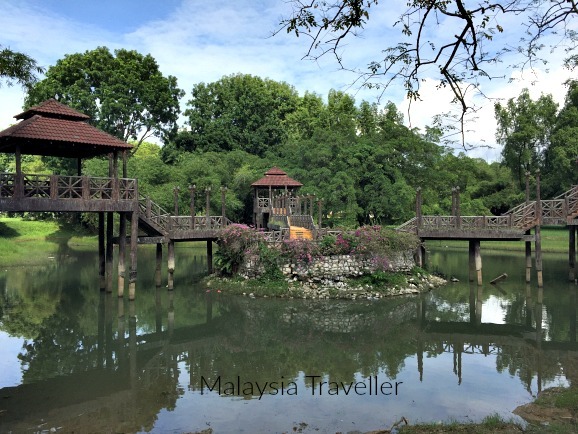 Given the differences in climate and natural vegetation between Ipoh and Fukuoka it is not a perfect copy of a Japanese garden but it is not a bad effort and still reasonably well maintained considering it was built over 22 years ago. This garden should not be confused with another Japanese Garden on Jalan Raja Dihilir, Ipoh which was padlocked and looking in poor shape when I saw it a couple of years ago. Elsewhere in the park is a larger lake spanned by a three-pronged concrete bridge topped with seating pergolas. A giant bamboo thicket is an impressive feature. There is a children’s playground, bicycle hire stall and a mini-road layout for children to learn about the highway code and road safety. There are also a couple of football pitches. 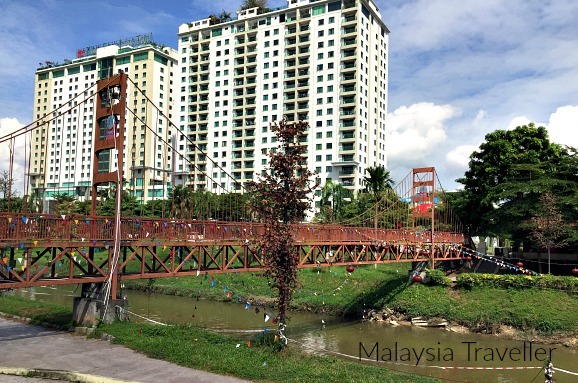 The Kinta River borders the western edge of the park and from the park’s large car park it is possible to access the walkway on the river bank known as the Kinta Riverfront Walk. 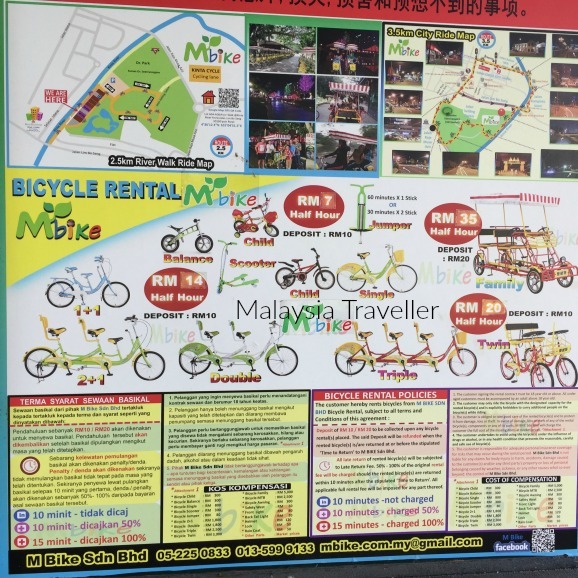 One of the shops rents bicycles (M.Bike Sdn Bhd) but was closed during my visit. In fact none of the shops were open apart from a Yemeni restaurant, Hadramout Paradise. Admittedly my visit was around midday and I believe the bike shop is meant to open around 5pm. A couple of pedestrian bridges span the river including this mini Golden Gate, known as Love Bridge which was opened on Valentine’s Day 2013. The tall building behind is the Kinta Riverfront Hotel & Suites which I believe is supposed to be managing Kinta Riverfront Walk. 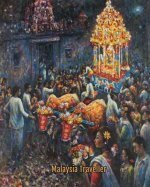 There is also a museum here called the Palong Tin Museum. Palong refers to the gravel pump method of tin mining which involves the use of high pressure hoses to separate tin ore from sand and clay. 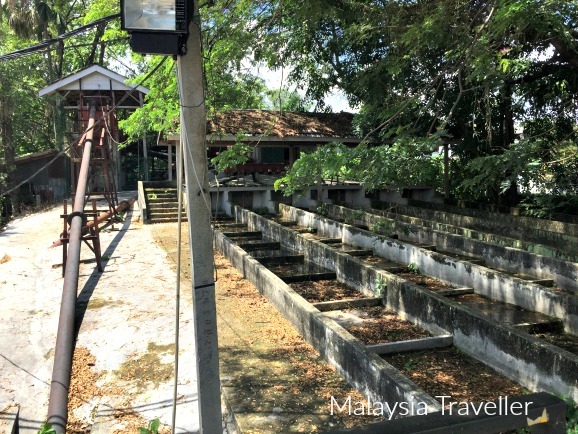 The museum has a small indoor exhibition area and some outdoor exhibits such as mining machinery and a mock-up of the palong sluices. Unfortunately this museum was also closed with no indication of when, or if, it opens. 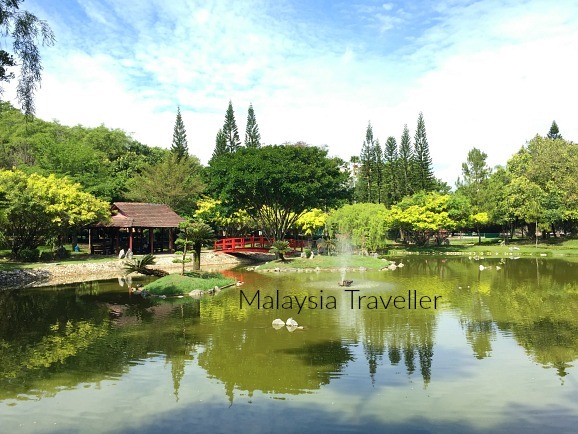 A nice relaxing park with an attractive Japanese garden which is worth a visit. Kinta Riverfront Walk has potential. I should return after dark to see the LED lights and find out if any of the shops and cafes are open, or, as I suspect, they are permanently defunct, which would be a shame. 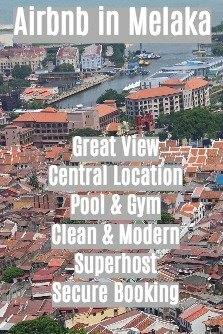 There are many places to see in Ipoh. See my Ipoh Heritage Walk for details.